Taking in one-half stitch on your seam will make a less bulky seam, but if the edge stitches are loose or messy, taking in the full edge stitch will give you a neater result. With right sides facing you, hold the two edges together. It is not necessary to pin the edges together since there are the same number of rows. 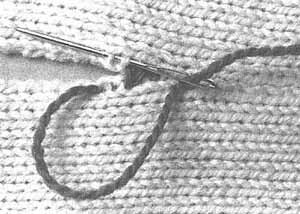 Insert the needle into one stitch, from right to left, under two rows of knitting, and draw the yarn through. The needle is inserted into the same row of knitting where the yarn was withdrawn on the previous row. Insert the needle under two rows on the opposite edge in the same way. Pull the yarn through the stitches enough to close the seam, but not so tightly that the seam no longer has the same "give" as the rest of the sweater.